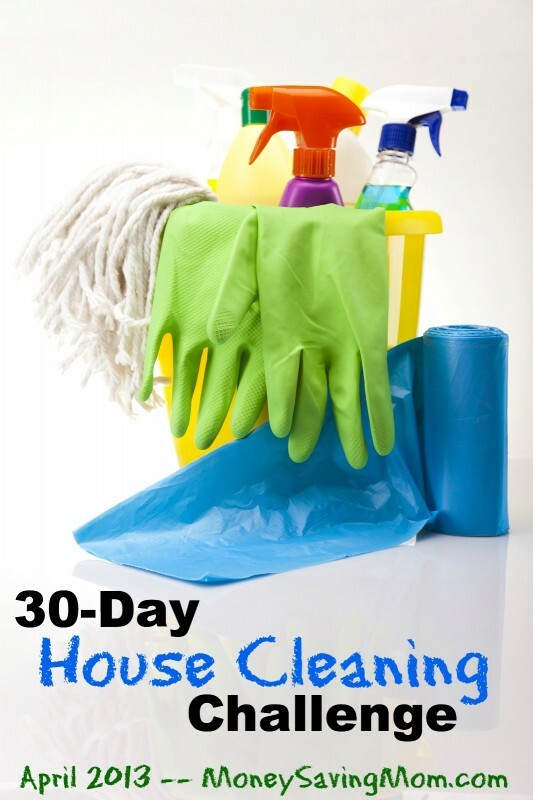 During the month of April, I’m encouraging my readers to participate in a 30-Day House Cleaning Challenge (read more here, if you missed my announcement about this challenge last week). Every week day morning at 9 a.m., I’ll post the daily project and every evening around 6 p.m. EST, I’ll post an update and link-up. Your project for today is to surface clean your bedroom(s). If you have multiple bedrooms in your house, you can choose whichever one most needs a good surface cleaning. I’m planning tackle the girls’ room today because it needs some work! Pull out any items under the bed that don’t below under the bed and make the bed (wash sheets/bedding, if needed). Clean fingerprints on the windows. Bonus: Spot-clean the carpets and walls. You can follow along with my list — or do whatever constitutes “surface cleaning the bedroom” to you. There is no one right way to do this. Then, come back here at 6 p.m. EST and I’ll show you pictures of my cleaning accomplishments for today and have a linky so you can link up yours, too! I plan on tackling the spare bedroom closet. It has become the space that “collects ” the stuff I don’t have the time to deal with while speed cleaning. I’m sure your girls are going to love their ‘fresh ‘ space! What have you found is the best thing to use to spot clean carpet? I’m late to the party here, but plan to jump in today. The last time you did this I was quite sick and didn’t get to participate. I love the way this is broken down into bite-sized jobs that won’t overwhelm us! I’m looking forward to this. I need a push to clean my bedroom. I’m better about the kitchen and bathroom. I will get to this today and share my results later. : ) Have a great day. I’ll be straightening up all three bedrooms and dusting the kids bedrooms only today. Hopefully I’ll have the time and energy once I get back from the store! My older daughter’s room needs it the most, but I’m going to start small and go with my younger daughter’s room. I also have a little decluttering with books in my bedroom, and I am working on a “quiet time” area I’m setting up in my closet for doing Bible study, etc. So setting it up will be a reward for working on the clothes and toys that have built up in my daughter’s room! We have a very large 10 shelf bookcase in our master bedroom. This spot has become a trouble area for collecting all sorts of ‘interesting’ clutter, not just books. I have made my goal to tackle 2 shelves of this bookcase every day this week. Each day I pick which two will be worked on, clear the entire two shelves, wash it down with a rag, and then pick up each item and decide if it will be donated, kept on the shelf, or moved to another area. This is not exactly surface cleaning, but it is what most needs attention in our room. I’m happy that I can see the progress already. 4 shelves down, 6 to go! 🙂 Looking forward to Friday when this project is complete. It’s been put off for way too long! I only took a fifteen minute time frame to clean. I managed to clear a shelf, dust, straighten in general, and make the bed. It’s getting easier and I like the results. We are kindrid cleaners. I set the timer on the microwave all the time to push myself to accomplish a project. I especially like to set the timer if I only have an hour to clean and want to accomplish as much as I can in each room of my home. I clean on commericals too. You’d be surprised how much you can get done. during that time. Just finished! 20 minutes gives me enough time to spot clean all of our bedrooms! We have 3, and keep them mostly pretty clean except my son’s room (1 yr) who feels the need to pull out everything he owns every morning… Lol. I also organized his closet a little bit and wiped down my dresser.